and thanks to ZenPawz, now your dog can! CEO Patty Key explains the origins of ZenPawz Aromatherapy Products and the benefits they offer: I began making buckwheat dog beds for friends and family over 10 years ago. They have been well received as wedding gifts, graduation gifts and holiday gifts. The idea of making the inner filling from buckwheat came from having a buckwheat pillow of my own. It gave such good support for my head and neck that I thought pets could also benefit from it. Also, if you've ever watched your pet make a 'nest' - paw at their bed or the floor - you can see why they love the buckwheat. The filling essentially has no shape so the pets can mold it into whatever nest they want. Not only does it make them more comfortable, but it allows them to position the buckwheat where they need the support. It is perfect for older pets who may suffer from arthritis or stiff joints. Almost everyone complains about pet odor so I've added some nice aromatherapy herbs to the filling; lavender, chamomile and peppermint. In addition to the pleasant scent they provide, peppermint is believed to help as a pest repellent and lavender and chamomile have soothing qualities. The warmers and spritzers were added as I got more questions about other aromatherapy products that are beneficial to pets. The warmers are small enough to fit in a microwave and provide soothing heat for pets with sore joints. The spritzers are great for pet massages or to spray on pet beds to freshen them up. Available in a variety of neutral colors and elegant fabrics, our ZenPawz Aromatherapy Pet Beds are filled with 100% organic buckwheat hulls on a cushion of downy-soft kapok. Kapok is an eco-friendly alternative to cotton and is harvested without pesticides and without damaging the environment. The buckwheat is grown in the U.S. without the use of herbicides or pesticides and is considered to be hypoallergenic. Intertwined with the buckwheat filling are the soothing aromatherapy herbs: lavender, peppermint and chamomile. These herbs will help to calm the pet, repel fleas and give the bed a fresh scent. How Are The Pet Beds Designed And What Makes Them Unique? Our pet beds are unique because they are constructed to provide both comfort and durability while using only the best natural/organic materials we can find we use imported hemp fabric/ organic cotton so our covers are not only beautiful but without the chemicals used to process traditional fabrics. The hemp is a strong, durable fabric and all covers are removable and washable. The bottom side of each bed has a layer of kapok sewn into individual channels to prevent clumping, a common problem in traditional pet beds. The kapok is extremely soft and provides a pillow of cushion for your pet. Next a layer of buckwheat is added on top of the kapok - sewn into a separate pillow. The buckwheat filling is light and flowing and moves with your pet to provide just the right support. Pets love to create a nest to sleep in and the buckwheat hulls allow them to move them around until the nest is just right. Plus, buckwheat hulls allow air to flow through the bed keeping your pet cool and dry, and unlike traditional foam or cedar filling, will last for years without clumping or breakdown. Fragrant, natural lavender flowers fill this adorable collar Charmz to help sooth and calm your pet. Use in any situation or keep on your pet all the time. Perfect for stressful trips to the groomer or vet's office. Let the natural aromatherapy benefits of lavender calm your pet. These make excellent gifts for new pet owners. Lavender fragrance will last approximately 30 days depending on usage. Occasionally scrunch the Zen Charmz to loosen up the lavender flowers. When your favorite pampered pooch needs a little extra relaxation just spray our ZenPawz Aromatherapy Spritzer. Our spritzer is ideal for pet messages or to spray directly onto your pet bed. Aromatherapy soothing spritzers contain 100% organic essential oils - lavender, geranium and chamomile. What Do Customers Say About Our Products? Thank you so much for the awesome beds; Kalli and Maggie love them. Kalli seems to have taken to them more readily and even got off my bed (yes they sleep with me) and went into den to sleep. I found her the next morning curled up like a queen. I really appreciate such a great product and will pass the info regarding the beds to all of my "fur friends". At Christmas we got a Zenpawz aromatherapy buckwheat pet bed for our 11 year old female black Labrador, Belle. Belle is a very active sporting field dog who spends many cool Canadian nights and hot desert days in Mexico sleeping in our RV. Belle has taken to sleeping on this bed like she would to a great BONE. At home she seeks the bed out and her sleep is peaceful without her usual snoring or bout of apnea. She still loves her afternoon naps but has more energy than before. We are impressed. The wonderful light fragrance from the herbs inside the bed distinguishes this bed from others, as does the high-quality fabric used. Looks good and smells good! My dog Nacho absolutely loves this bed! Nacho was just recently adopted from a local shelter and I wanted to make him feel extra special. This bed is perfect for him! He sleeps on it every night and just absolutely loves this bed! Thank you very much and I would recommend this product to anyone looking for nice bed for their animal. 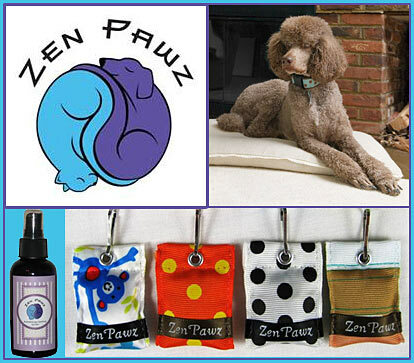 Order Your ZenPawz Products Today! ZenPawz aromatherapy pet products are unique, handmade products created from organic, natural fabrics and essential oils. Our philosophy is to use the finest eco-friendly and hypoallergenic materials that we can find. Our pet beds, pet warmer and spritzer are the perfect addition for any pampered canine! So don’t wait, check us out and order your products today!